Foot Locker and Jordan Brand recently announced the digital launch of their joint holiday campaign featuring NBA star Kawhi Leonard, with cameos by Leonard's teammate LaMarcus Aldridge and rapper Nipsey Hussle. 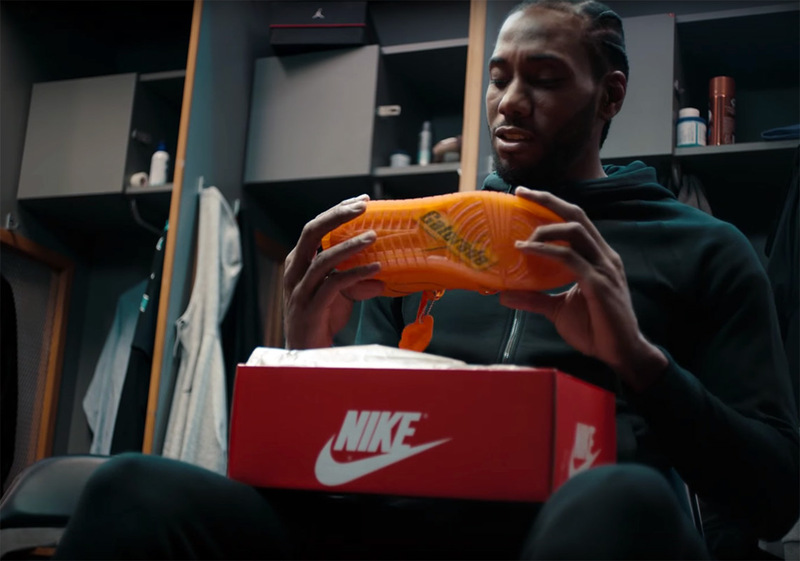 The spot, titled "Bold Like Kawhi" comedically highlights Leonard's unexpected day in his new Air Jordan I OG High Gatorade sneakers. The spot opens with Leonard in a locker room, unwrapping a holiday gift from Aldridge. Inside the gift box he finds an orange flavorway pair of Gatorade AJ Is. Leonard, who is known for his focused and even-keeled demeanor, goes on to have an unusually crazy day in his bold new shoes. He does karate, drives a low-rider, hits a recording studio with Hussle, parties at a nightclub with Les Twins and to top it off, he chronicles the whole day on social media. When asked by a reporter about his day, Leonard says with a sly grin, "I was hacked." "I had a ton of fun partnering with Foot Locker and Jordan Brand to show off another side of my personality that most fans don't get to see every day," said Leonard. "Being part of a holiday campaign that pays homage to the original 'Be Like Mike' Gatorade ad is really special." The campaign features a premium assortment of the Air Jordan Gatorade Collection, including the Air Jordan I OG High Gatorade in four flavorways – Orange, Lemon Lime, Grape and Cool Blue – (launching Dec. 26) and Air Jordan VI Gatorade (launching Dec. 30), available at select Foot Locker stores nationwide and on footlocker.com. Visit Launch Locator to find local stores and release procedures. "We were thrilled to partner with Kawhi Leonard for our Jordan holiday campaign," said Patrick Walsh, VP of Marketing for Foot Locker North America, "We all know Kawhi is bold on the court, but highlighting his style and confidence in the new Air Jordan Gatorade Collection will help all of our customers at Foot Locker make bold sneaker selections this holiday season."